There is no better way to learn the science of the river than to be immersed in a series of river fieldtrips. Millennium Kids worked with Wesley College Junior School teachers to design a 9 week scientists in residence program on the banks of the Swan River, exploring the past, learning about the human impacts on the river and citizen science programs to help the community engage with real science and river care. Students visited the river each week along with scientists, citizen scientists and river stakeholders. Students took water samples, met with City of South Perth Environmental Management team and learnt about managing river and wetland health. Each fieldstrip saw the students writing down their observations, monitoring the site and developing inquiry questions and pitching ideas for river care. The highlight of the program saw the students meet with Green Lab Ambassadors Prof Lyn Beazley and Patrick. Patrick, an avid bird watcher, painter and MK Youth Board member talked to the students about his passion for birds and the need to protect their habitats. Patrick talked about how he spends his weekends monitoring birds at his favorite bushland sites with his father and sending the data to Birdlife Australia. Prof Lyn Beazley discussed her passion for science and the journeys it has taken her on, monitoring birds, visiting the Antarctic and using science to solve the big questions. 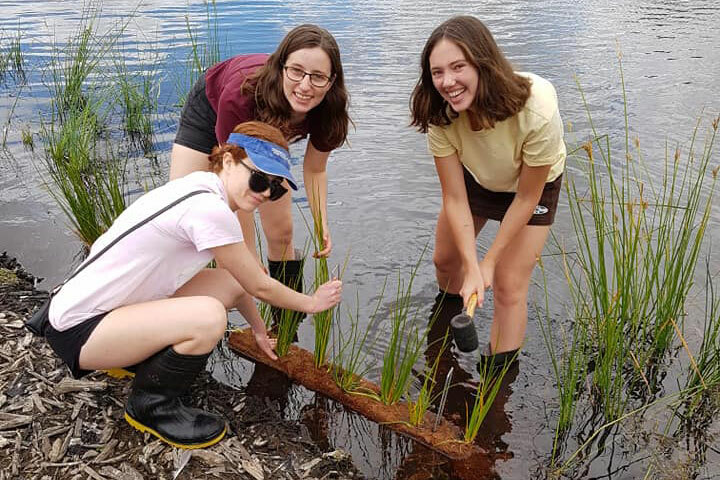 This is the second year of the program and the final week culminated in a sedge planting activity at Lake Douglas in Sir James Mitchell Park. Students planted 160 sedges on the banks of the lake for bird habitat. The students at Wesley College will help Millennium Kids Wetland Warriors teams plant the site with native vegetation and monitor the plant growth over a three year period. The Department of Biodiversity, Conservation and Attractions has funded Millennium Kids Wetland Warriors for three years, with a Community Rivercare Program grant. 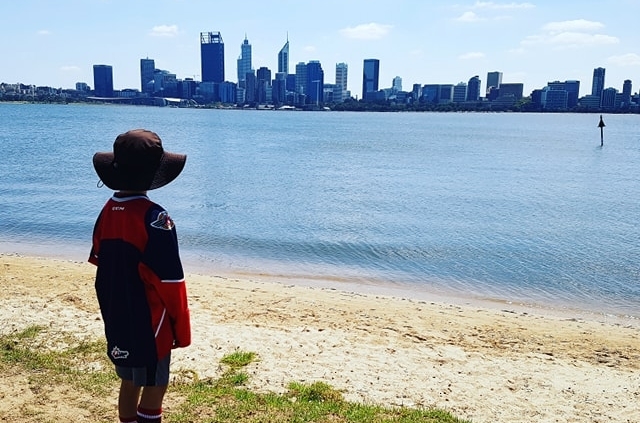 The Green Lab introduces a new generation of Perth citizens to help conserve the natural, cultural and social amenity values of the rivers, tributaries and urban drains within the Swan Canning Catchment. Can we build more habitat for the turtles? Nathan did some research on Oblong turtles after a Green Lab workshop with Millennium Kids. A lot of them live in Perth at Lake Douglas. Oblong turtles like to lay their eggs in sandy patches along the lake. One problem is there are No sandy patches at Lake Douglas! Without sandy patches for breeding this endangered species cannot survive. There are a few sandy patches but not enough to support an entire population of these amazing creatures. We can help this by making more sandy patches. But for that we will need a lot of sand. This may cost a lot, but we can try getting it for free at a place such as Soils aint Soils, which is a big soil company. Then our school team and Millennium Kids could use the sand and make some sandy patches. Maybe if we could do that then oblong turtles are saved! Editor’s Note: Nathan is taking part in a Green Lab workshop series at his school. He wrote to Millennium Kids to see if he could get help for his project idea. Millennium Kids will explore this issue with Nathan and we will see what we can do to help the local Oblong turtle population. https://www.millenniumkids.com.au/wp-content/uploads/2019/03/Nathan-Year-4.jpg 640 640 admin https://www.millenniumkids.com.au/wp-content/uploads/2018/06/Millennium-Kids-banner-logo.png admin2019-03-24 08:39:222019-03-24 08:55:12Can we build more habitat for the turtles? Can we please put clean water in Lake Tonduit because, if we don’t the fertilizer will make the algae grow and then that causes algal blooms. Algal blooms are a threat to fish and humans. The reason this is a threat to humans is because a person might catch a fish in Lake Tonduit or the river that is poisoned by the algal blooms and then he might eat it and then he’ll get poisoned too. But worst of all Millennium Kids figured out that Lake Tonduit leads to Lake Douglas and Lake Douglas leads to the Swan River so when Lake Tonduit gets contaminated, all the other lakes get contaminated as well and we won’t get to swim, row or eat the fish in the area, and we will have to wake up to horrible black and mucky water on a beautiful day. What will it look like in the future? I take students to this little secret place of mine because their imaginations go wild, too. You can see it in their faces as I set the scene. Walk quietly, listen to the sounds. Close your eyes, imagine the past, the birds, the families who hunted here, the Chinese who managed the market gardens. I share stories of swimming in the river, the birds, the people I have met who have shared their stories, too. Of Tom Hungerford as he opened the gate in the cold of the morning to look for cows, of Uncle Noel Nannup teaching me Nyoongar names, of the spirits that sit above the trees watching over us as we talk about the role of custodians, carers for our river, now and in the future. Does dog poo make the river sick? Did you see the chitty chitty? Will those trees be affected by climate change? Why did people take the trees out? What poison is in the cigarette butts? These questions will form the basis of the next 9 weeks of Green Lab, where students from Wesley College will explore the river alongside scientists, artists and elders to learn about the area and make a plan to care for country. They’ll even get to meet Prof Lyn Beazley AO, Chief Scientist for WA 2006 – 2013. How nice is it to be out and about with the warm summer weather!! There are so many places you can go at the moment to have a meal from a food van- they are at our local Saturday farmers markets, twilight markets and food truck nights in the local park. You can go along, eat, listen to music and have a look around, but have you thought about the waste they generate? All vans use disposable plates – mostly cardboard and plastic cutlery, so even though some of them biodegrade imagine how much waste each event makes? We have decided to take our camping plates and forks as well as a sealable container to do our bit for the Waste Free Movement. We also ride our bikes which saves us time in the traffic, finding parking and the ride home in the dark is always an adventure! What can you do for the MK Waste Free Movement? A whole lot of excitement in the MK Office this week. Dean from The Law Society Western Australia, rang to say The Lore Law Project been recognised by the State Government with a $200,000 grant, the maximum grant amount, from the Criminal Property Confiscation Grants Program. I had the pleasure of relaying the message to Jaz, our MK Indigenous Co Facilitator in Kalgoorlie. The excitement was palpable. When Jaz was a kid she went to Sevenoaks College in Cannington. She joined The Public Transport Authority’s Right Track program, designed and facilitated in collaboration with Millennium Kids, and helped create a new way of thinking when working with young indigenous people on the local Perth train line. Kids were getting up to mischief, displaying anti social behaviour, not paying their train fares and getting into trouble. The Sevenoaks kids went on camp with Millennium Kids for a Ningaloo Explore experience in the Cape Range National Park. With five days of leadership training, kayaking, native animal monitoring and meeting with local elders, kids were immersed in the local environment. They came out with a Certificate1 in Leadership, and were prepared to lead their community. They tackled the anti social behaviour on the trains in a youth led, culturally sensitive way. The Right Track continues to be an award winning youth program. In 2016 Jaz joined the Millennium Kids team again. This time as a leader and co facilitator of the Lore Law Project, a program to address the high rates of indigenous youth incarceration in the state. Along with other Sevenoaks graduates, Jaz helped design the Lore Law Project alongside elders, Millennium Kids, The Law Society, and Kammi from Media on Mars, with input from a range of stakeholders. How do we tackle the big issues with indigenous kids? How do we skill them up, empower them and keep them out of gaol? Law Society President Greg McIntyre SC said, “The Law Society is delighted to receive this grant for its Lore Law Project. From its inception, the Project has engaged with Aboriginal communities, young people and Elders, who have been central to its planning, development and implementation. The Lore Law Project provides an important conduit through which young Aboriginal people can voice matters of interest or concern to them. Stakeholders from the police, judiciary, legal profession and support services also have an opportunity to engage with Aboriginal communities in a two-way process. At the recent Millennium Kids AGM at Trillion Trees headquarters in Hazelmere, twenty young people aged 5-20 sat in the conference to pitch their unique project ideas to Board and Council members. These ideas ranged from school-greening petitions, monitoring local wildlife, delivering education programs to anti-climate change alliances with corporate stakeholders in Australia and beyond. The Kids are responding to a dire need for environmental action in the Perth region. Millennium Kids is where children and young people are empowered to change the grim future presented to them by the media and older generations. It’s a place where things get done, by young people who care. With Kids at the helm, the MK team worked together to turn the ideas into action through the Green Lab Project, a citizen science initiative to investigate and increase urban canopy cover in the Perth region to cool the city. Based on the ideas of 500 young people in Western Australia, the project has been selected by StartSomeGood and Future Super as one of the six best climate change initiatives Australia wide in 2018. The Green Lab Project will piece together the fragmented picture of Perth’s urban vegetation and biodiversity, encouraging collaboration and communication between local governments, businesses, and citizens for a more sustainable future and a cooler city. To fund Green Lab Millennium Kids has been running a month-long fundraising campaign through StartSomeGood with a target of $10 000. The campaign was launched on the 4th of November with a screening of ‘Salt of the Earth’ at the Grand Cygnet Cinema in Como, and Kids ran their first Green Lab in South Perth on 25th November planting sedges for wildlife at Lake Douglas in South Perth. Noni visited the Millennium Kids AGM after hearing the children’s Green Lab poem at the Trillion Tress Launch earlier in October. Noni was inspired to contact the organisation and find out more about them. Noni is a student of journalism and is keen to help the Millennium Kids get their stories in the media. Noni is now a Youth Board member.